In preparation for my upcoming Skyrim review session (and by “session” I mean “10 days of doing nothing but play the game”), I’ve been sinking some actual time into Oblivion in order to gain a little more context. The half-dozen hours of play time I’ve dabbled in over the past few days confirm exactly why I haven’t played a Bethesda/Obsidian RPG for more than an hour. It’s not that I don’t like the games, it’s that once I start I know I’ll become engrossed and be unable to stop. Plus, as I’ve said elsewhere, I play them wrong. My Oblivion time has mostly been me traveling to the edge of the map and trying to determine the game world’s boundaries. I almost admire the graceless and heavy-handed approach the game takes to its invisible walls: It actually tells you to turn around and go the other way. In six hours of play time, I’ve barely leveled up once and passed through two whole villages. 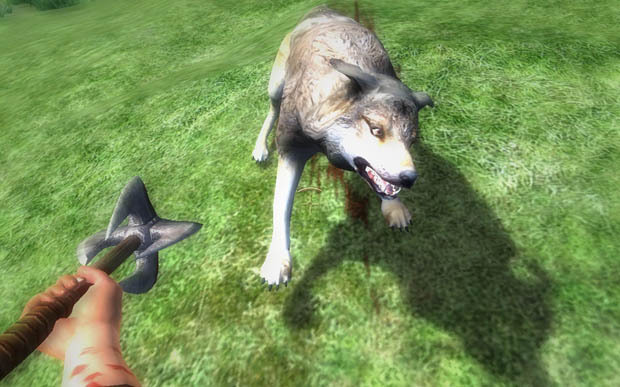 I have, on the other hand, spend a lot of time shooting angry wolves in the mountains, hitting them with arrows before they even realized I was around. I realize too late that I probably should have given my character a better moniker. A code name, maybe. Something like… “Wolf Sniper.” No, no… that’s not quite right. I’ll keep working on it. This entry was posted in Games and tagged oblivion, skyrim. Bookmark the permalink. I love the concept of these games – but for the most part, I find the worlds pretty uninteresting. The Thieves Guild questline in Oblivion was a lot of fun, though – but woefully, it was the highlight of the game for me. Very curious to hear your take on Skyrim – I think it’s going to get similar reviews to Oblivion (breathtaking in scope, still glitchy, etc. etc.) in general, but I imagine you’ll have a fresh perspective on it. No, that’s pretty much the right way to play Bethesda RPGs – screw around for a bunch of hours and then stop when you get bored. Sometimes it takes upwards of 200 hours to get bored because there’s so much to screw around with. Yeah, I’m looking forward to your review as well. I bought Oblivion and Fallout and tried to like them, but they are just so darn bland. And the gameplay is clunky. But I’ve never been a big sandbox game fan because of these issues. My biggest problem with Oblivion was that Bethesda didn’t really embrace their own creation. Morrowind was a really clunky game to play, down right not fun, really. But the world was so weird and unique that I couldn’t help but be drawn into it. Oblivion was a big gameplay improvement from Morrowind (yes Oblivion is clunky, but Morrowind is a lego shaped turd), but the world was so completely generic Tolkien fantasy. Skyrim seems to be embracing it’s own thing again, though. I’ve noted Morrowind’s music is used in places, and the Imperials have their Romanesque armor back. High hopes. That’s true that Morrowind was a little more unique in its world…. but on the other hand, part of the appeal of this type of game is the role-playing process (in the Western sense) – i.e. building up your avatar with new loot and whatnot. But Morrowind was such a hideous game that I had no motivation to do anything, really. By the same token, Oblivion was really dated about a year after it came out, with its cookie cutter dungeons, and… well, cookie cutter everything, really. And repetitive use of textures. Honestly that’s never been a part of the TES games I’ve enjoyed. It always felt to me like their leveling system simply made you better at things you could already do, it never added new things for you to do. It just made much difference to me how leveled up I was. The perks in Skyrim sounds like they are addressing this. I purchased Oblivion and it took four years before I made myself sit down and actually play it past the Imperial sewers tutorial-as-gameplay shenanigans. I actually found myself Googling “how to play Oblivion” because I was obviously doing it wrong. I attempted to follow the main questline immediately. Afterall, it’s an RPG; I must go where the story tells me to go. It wasn’t until several hours and deaths later that I realized Oblivion was less about story progression and more about character progression. I appreciate the idea of getting lost in a game world and building up your character’s story, rather than simply following the story handed to you, but this type of game is not really what I want from an RPG. Skyrim looks amazing and there’s a large voice in my head that says “DAY ONE PURCHASE!” and there is a smaller voice that says “You know you won’t enjoy this,” which is probably true. I’ll be interested in the Talking Time feedback on this one. I have to say Morrowind and Oblivion didn’t click with me because the nature of first person gaming automatically pushes me into first person shooter mode (I am aware of third person options but it doesn’t feel right). As for Fallout the addition of a role playing to an FPS is always welcome. Oblivion was fun until you go through the first oblvion gate. After that its a pain to explore and do the fun stuff because each time you find aomerthing new to explore there is a new oblivion gate. It also didn’t help that area inside the oblivion gates weren’t fun. The appeal to Morrowind was the exploration and how alien the world was. A city in the shell of a giant crab? I gotta check this out. Why is there a giant mushroom? Why do I get a doomed world when I kill this guy for his sweet armor? I would love for Skyrim to maintain the sense of awe instead of turning to tediousness towards the end.